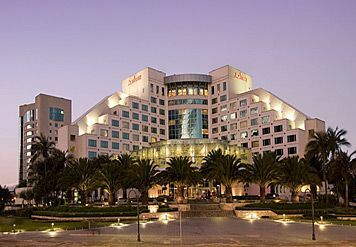 The JW Marriott Quito is a luxury property situated on the famous Amazonas Avenue, approximately five miles from Quito Airport. Local attractions include the Bird Sanctuary, Casa de la Cultura, Banco Central Museum, and Metropolitan Park. Hotel amenities include free coffee in the lobby, shoeshine, babysitting, ATM, concierge, daily housekeeping services, evening turndown service, express check-in/out, 24-hour room service, safe-deposit box, laundry/dry cleaning services, local area shuttle (fee), florist, and gift shop. High-speed and wireless internet access is available in all guest rooms and public areas. Room amennities include: Air-conditioning with individual climate control, alarm clock, bottled water for a fee, coffeemaker/tea service, crib (upon request), electrical adapters, iron and ironing board, luxurious bedding with down comforters, custom duvets, cotton-rich linens, down feather pillows, safe, bathrobe, bathtub with spray jets, hair dryer, color cable/satellite television, and telephone with voicemail. Guests may also enjoy the outdoor heated pool, children's pool, fitness center, and Jacuzzi. Onsite drink and dining is available at the Bistro Latino, La Haciena Restaurant, and The Exchange Lobby Bar & Sushi Bar.